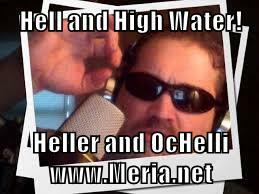 4/10/18 Hell & High Water, with Meria and Chuck Ochelli. Todays topic is the environment. What is a patriot? Are you a patriot for humanity? Iowa Farmers & trump; laws and freedoms apply to all;trump is an open enemy of the environment;Fukushima;nuke plants;Indian Point and 9/11;endangered species act gutted;climate changes;Pompeo;Calvinism;religious distortions;Steve Wozniak & f/b;what are the two most important issues we face? destruction of our support systems;the movie “Rainman” when autism was a rarity;are you having a good time? the uptick in illnesses;toxic cocktail;trump Tower fire; distractions and lots more. One Response to "Hell and High Water, with Meria & Chuck Ochelli"